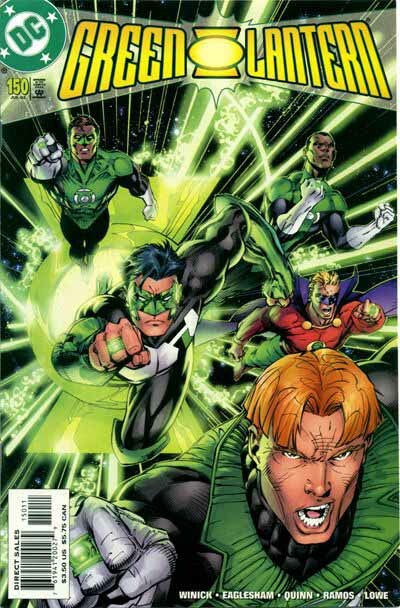 The main Green Lantern title relaunched in 1990 utilized the three Green Lanterns of Earth: Kyle Rayner (who had replaced Hal Jordan in EMERALD TWILIGHT), Guy Gardner and John Stewart, and was successful enough that in 1992, John and Guy each spun off into their own series. John was featured in MOSAIC, with a logo combining the familiar Ira Schnapp top line with a new section created by Curtis King, who told me that getting the mosaic tile pattern to work inside the letters was very tough. This logo follows the style of the then current one on the main title, with the top horizontal strokes of the letters much wider than the rest. This creates a rather odd lantern shape in the spot of the O, but generally works fine, and I like it. As it turns out, I was involved in this one, too, having been paid to letter the word MOSAIC, but I think it was over Curtis’ design, and I know he added the mosaic tiles. Here’s a better look at that in a version I found in the DC files, one where the letters have been separated. I think this was done for the final issue. 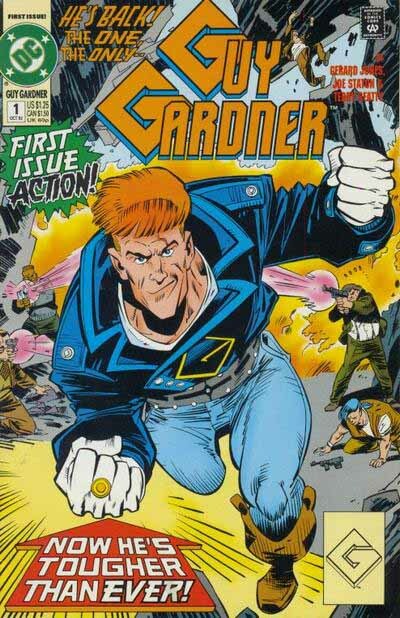 The GUY GARDNER logo, on the other hand, is pretty awful. The diamond-shaped G’s were intended to be his jacket symbol, but as you can see, that wasn’t followed through with on the art, and the fact that they are completely mismatched by the rest of the letters, which are placed awkwardly over the G’s makes for a mess. Now, who was the designer of this one…? Oh, yeah, that was me. 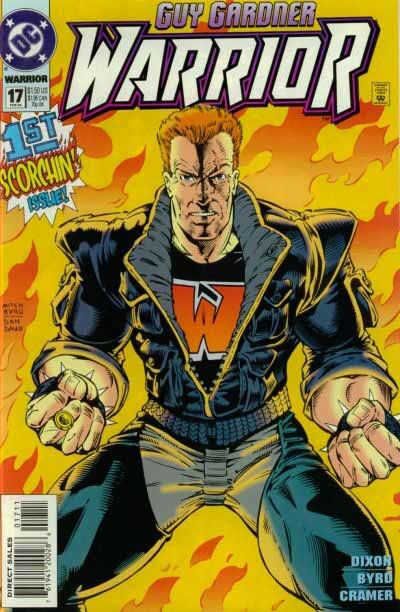 The words GUY GARDNER had more normal G’s, which was an improvement, and the word WARRIOR was designed by Curtis King and inked by me, so I got a chance to atone, and while not a particularly great design, it’s much better than the previous one. If I were doing it today, I’d remove the overlap on the R’s, and raise the center stroke of the W to eliminate that small open area at the top, but otherwise I’d be okay with it. And doesn’t the top line look much better without those ugly G’s? Over in the main title, a new logo was introduced for issue 51 in 1994, created by Ken Lopez. I like this one quite a bit: the lantern shape is an attractive variation, the letter forms are nice, though I think the right legs of the R’s should have started further right of where they are, and been a little wider. The angled tips on the horizontal strokes of the G, E and L are a good idea. And the overall structure of the logo, it’s angle, perspective and drop shadow add three dimensionality that had long been missing on this title. Sure, it’s reminiscent of the Steranko X-Men logo, but that’s not such a bad thing. 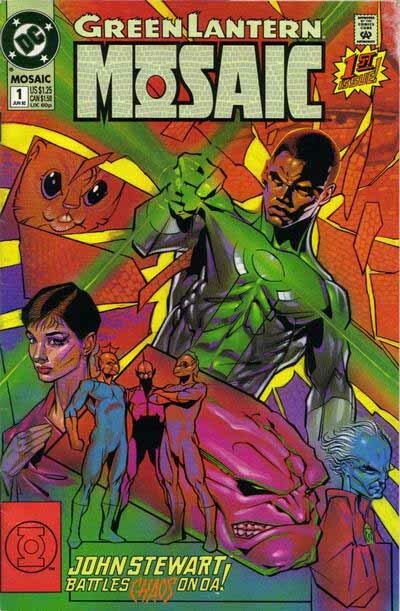 The 1990’s into the early 2000’s saw lots of Green Lantern mini-series and one-shots, too many to cover here, but I did want to show this one, logo by me, because I think it’s a rare example of a round logo design that works both with the art and the story. It was meant to look like the kind of monograms or wooden stamps often seen on Chinese art. It’s a bit hard to read, but in this case intentionally, as the first impression is meant to be of Chinese characters. 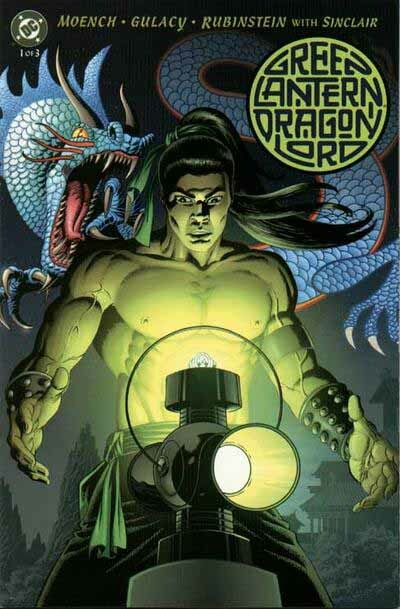 The main title had one more logo revision for issue 150 in 2002, this one also by Ken Lopez. Here Ken began with very condensed but still quite readable letters on either side of a very simplified lantern shape, in the manner of past logos. The letters are all the same proportions, and the extra space created on the left side is used for part of the trade dress, which works fine. I particularly like what he did with the background shape, a simple energy burst around the lantern, and straight radiating beams behind the letters. That was the sort of thing I should have done on my version seen earlier. I also like the perspective that puts the bottom of the letters closer to us. Really a fine design. We’re in the 21st century now, and one more round of shake-ups and relaunches are just ahead, bringing us up to the present. Be here for the conclusion of this series next time! This entry was posted in Logo Studies on November 18, 2007 by Todd. I’m really enjoying your logo studies. Ironically, a few years back I bought a Green Lantern lot on eBay and it included several that you displayed, to include Emerald Dawn, GL #1, Tales of the GL Corps, Mosaic and Guy Gardner #1. I thought I should poke my head out of the sand and see what they’d done with Hal since my preferred roaming area of the Silver Age. Frankly, I pretty much hated them all, but that’s a discussion for another day. I like your insights and I’m learning a lot. By the way, as a man married to a cat lover and currently supporting five of the freeloaders myself, my condolences on the loss of your pet. Also, “Robby Reed” contacted me and I got him hooked up. Thanks, Bryan, glad you’re enjoying it. 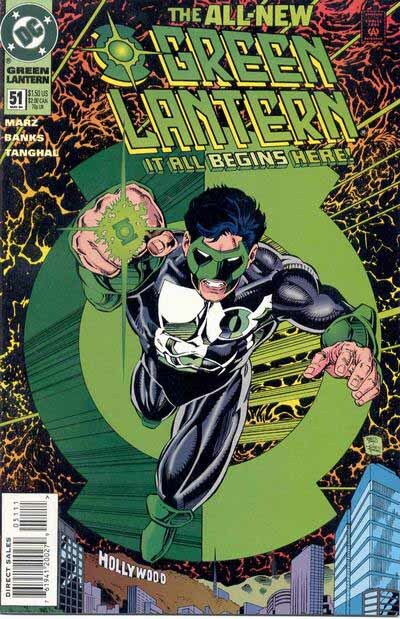 Kyle Rayner didn’t take over from Hal until 1994, not 1990 as you list in the above post.